We are Loud & PROUD on the Canawrap Main Stage for New West Pride Week! 04 Jul We are Loud & PROUD on the Canawrap Main Stage for New West Pride Week! 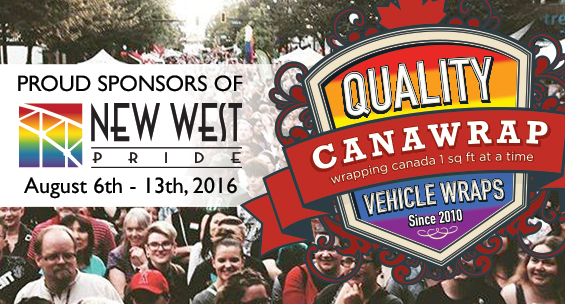 Canawrap is proudly sponsoring the New West Pride Week August 6th – 13th 2016 and will keep in LOUD & PROUD on the “Canawrap Main Stage” front and center of the New West Pride Columbia Street Party, last year was crazy fun and this year will be double crazy fun! The Canawrap Main Stage will be hosted this year by Jazmine Khan and featuring live performances by Michael Fraser, Kimmortal, Mz Adrien, and Top Less Gay Love Tekno Party! This is a free event packed with talent, 4 beer gardens, a Drag Show Stage, Carnival Sized Cinnamon Hearts Puppet Show, ‘Consent Tent” fetish zone, food trucks, vendors, local organizations and a children’s area….did we mention 4 beer gardens? yes we did….there’s 4 beer gardens! In light of recent events in Orlando, San Francisco, even here at home, as well as the continued criminalization of LGBTQ+ people in some countries overseas, we have all been reminded that Pride is just as important as it has ever been in the past, huge strides have been made in North America in recent years however SO much more work needs to be done, we are incredibly excited to be a part of New West Pride. We hope to see you all there LOUD & PROUD!